Upon the accidental death at age 55 of his father (Dietrich), the eldest son (Ernst Sr.), age 33 and still single, becomes the family patriarch. Given that both his father and grandfather were both married in their early 20’s; 40% of the American farm population was from Germany; and his two younger sisters were already married at age 22, one can only wonder why Ernst Sr. was still a bachelor. Rumor has it that he eventually wrote to Widheim, Germany searching for a bride. He connected with Mary Westenfeldt, a girl from his 1880? confirmation class who had been jilted recently and welcomed the idea of leaving Germany – forever. On May 22, 1902 in Wetaskiwin, Alberta, Ernst Dietrick Humbke Sr. & Mary Westenfeldt were married at age 35 and 33. At that time the average life expectancy for men was 47 years and women 50 years. They had a family of 3 girls and 2 boys. Mary stepped on a rust mail and passed away from blood poisoning at age 75. Ernest passed away quietly at home a month before his 80th birthday. 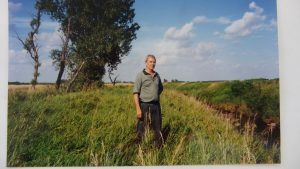 Ernst Sr. was a hard working, stern German farmer who firmly believed in God. Whether it was due to his upbringing, the hardships he faced in his life time, death of two young sisters or other reasons, many of his actions in the USA and Canada would indicate a strong religious faith. 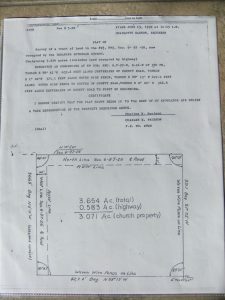 at a meeting when members were arguing over the cost of land for the church Ernst Sr. stepped forward and donate 3 acres of his NW quarter of Section 6, Township 97, North of Range 26 for a church and cemetery. Agreement that Land must be used for a German Lutheran Church or reverts to heirs. It is interesting to note that the 3 acres where the church was built is in Hancock County, immediately South of Winnebago County and immediately East of Fairbault County. It meant that if a marriage occurred in the church and the people were from Winnebago County (as the Dietrich Humbke family was) the wedding party would have to cross the road to the North and climb over the fence to perform vows in their respective county. Others from Fairbault County would cross the road and fence to the West and complete their vows in the field. In Canada this commitment to religion by both Ernst Sr. and his mother Maria Humbke (Westenfeldt) would be even more evident. Winnebago Industries, Inc., in Forest City, Iowa. https://winnebagoind.com/company/visit It is well worth the time. Over the years Ernst Sr. had save money. On November 18, 1894 Ernst Sr. had bought the West 1/2 (80 acres across the road from his dad’s farm) of the NE Quarter, Section 6, Township 97, North of Range 26 from Lorna Frank (North part) and Angnes Gray (South part). On April 14, 1899 he sold this land to Henrick and Sophia Conradi (Humbke), who lived there until 1914. On March 15, 1999 he bought the NW Quarter of Section 6, Township 97, North of Range 26 from Thomas and Susie (wife) Gray for the sum of $4,100 cash. Ten days later on March 25, 1999 he bought the SW Quarter of Section 6, Township 97, North of Range 26 from B.G. & Martha (wife) Clark and Moses & G.C. (wife) Donelson for the sum of $3,937 cash; assumption of one mortgage of $2,000 at 7% annually; and Rail Road tax against the said land for 1998. On April 12, 1906 these two quarters were sold to Lyman and Samuel Hough. 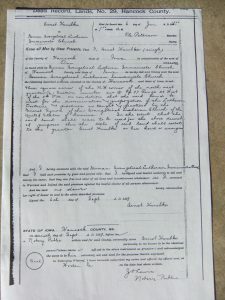 The deed specifying details was not located, but proceeds were probably used by Ernst Sr. to purchase additional 14 miles land West of Wetaskiwin. ……By the 1870s, farms and small towns blanketed the entire state. Also in that decade, Iowa farmers established definite production patterns, which led to considerable prosperity. During the Civil War, Iowa farmers had raised considerable wheat. After the war, however, prominent Iowa farmers like “Tama Jim” Wilson, later to be national secretary of agriculture for 16 years, urged farmers to diversify their production, raise corn rather than wheat, and convert that corn into pork, beef, and wool whenever possible. For many generations, Iowa farmers have followed Wilson’s advice. Even though farmers changed their agricultural production, farm work continued to be dictated by the seasons. Wintertime meant butchering, fence mending, ice cutting, and wood chopping. In the spring, farmers prepared and planted their fields. Summertime brought sheep shearing, haying, and threshing. In the fall, farmers picked corn, the most difficult farm task of all. Farm women’s work also progressed according to the seasons. During the winter, women did their sewing and mending, and helped with butchering. Spring brought the greatest activity. Then women had to hatch and care for chickens, plant gardens, and do spring housekeeping. During the summer, women canned large amounts of vegetables and fruit. Canning often extended into the fall. Foods like apples and potatoes were stored for winter use. Throughout all the seasons, there were many constants in farm women’s routines. Every-day meals had to be prepared, children cared for, and housekeeping done. With gardens to tend and chickens to feed and water, farm women had both indoor and outdoor work. Through their activities however, women produced most of their families’ food supply. During the late 1800s and early 1900s, social activities for farm families were limited. Most families made few trips to town. Some Iowans remember that even in the 1920s, they went to town only on Saturday night. Family members looked to each other for companionship and socializing. Moreover, the country church and the country school were important social centers. Families gathered at neighborhood schools several times each year for Christmas programs, spelling bees, and annual end-of-the-year picnics. Pioneer families faced additional hardships in their early years in Iowa. Constructing a farmstead was hard work in itself. Families not only had to build their homes, but often they had to construct the furniture used. Newcomers were often lonely for friends and relatives. Pioneers frequently contracted communicable diseases such as scarlet fever. Fever and ague, which consisted of alternating fevers and chills, was a constant complaint. Later generations would learn that fever and ague was a form of malaria, but pioneers thought that it was caused by gas emitted from the newly turned sod. Moreover, pioneers had few ways to relieve even common colds or toothaches. 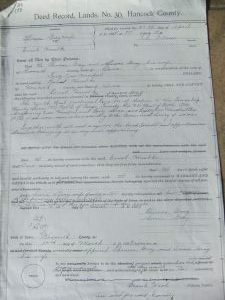 Ernst Sr. joins a group of Indians East of Edmonton and goes South to the Battle River where he files for 3 homesteads. 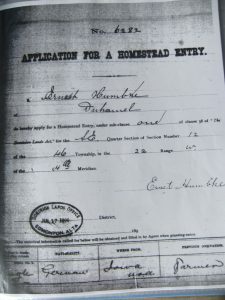 Ernst Sr.’s father, Dietrich, had been killed in an accident on July 19, 1899 hauling logs to build a church in Hancoch County, Iowa and on July 17, 1900 Ernst Sr. was in the Dominion Lands Office, Edmonton, Alberta signing “A Claim For A Homestead Entry” and “An Application For A Homestead Entry” for 160 acres directly East of Wetaskiwin, Alberta. You may be wondering about the proper spelling of of the name Ernst Sr.. On most document he himself signs his name as Ernst whereas most government officials in North America spell it as Ernest. On his grave stone his name is spelt Ernest and from now on I will refer to him as Ernest Sr., as the name of his oldest son is also Ernest. My plan is to publish FAMILY BLOG #6 – SEPTEMBER 28, 2016 ABOUT SOPHIE, THE OLDEST HUMBKE GIRL WHO MARRIED HENRICH CONRAD CONRADI AND SPENT HER LIFE IN TITONKA, IOWA.